Form 7162 or the "Report To The United States Social Security Administration" is a form issued by the U.S. social security administration. The form was last revised in July 1, 2011 and is available for digital filing. Download an up-to-date fillable Form 7162 in PDF-format down below or look it up on the U.S. social security administration Forms website. AND RETURN THIS FORM IN THE ENCLOSED ENVELOPE. SEE INSTRUCTIONS ENCLOSED. Print your address here only if it is different from the one shown below. CONTINUE ON THE BACK. YOU MUST SIGN YOUR NAME IN ITEM 7 ON THE BACK OF THIS FORM. not yet reported to SSA? business or farm) since your last report of work to SSA? receive Social Security benefits because you have this child in your care. delinquent debts under these programs. our System of Records Notice 60-0069 (Claimes Folders System). claim, or could result in the loss of benefits. consulate, VARO or U.S. Social Security office. 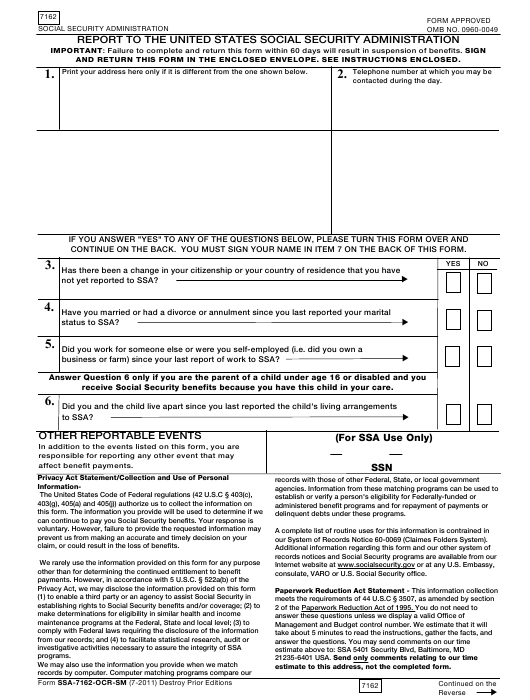 THE OTHER SIDE OF THE FORM, YOU SHOULD GO TO ITEM 7, SIGN, DATE, AND RETURN THE FORM. If you answered "Yes" to question 3 on the reverse, complete the information below. If you answered "Yes" to question 4 on the reverse, complete the information below. If you answered "Yes" to question 5 on the reverse, complete the information below. Social Security taxes on earnings from this work? If you answered "Yes" to question 6 on the reverse, complete the information below. (e) If the child has not returned, print the address of the child here. someone else to do so, commits a crime and may be sent to prison, or may face other penalties, or both.